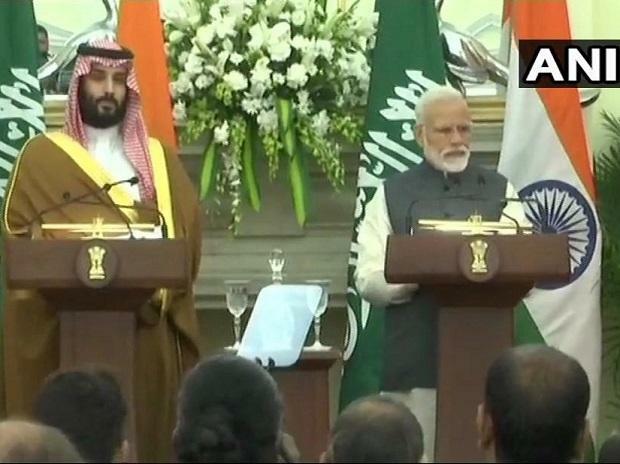 Saudi Crown Prince Mohammed Bin Salman and Prime Minister Narendra Modi have condemned the Pulwama terror attack by JeM while "complicity" of Pakistan was underlined during the meeting between the two leaders, external affairs ministry officials said on Wednesday. Briefing reporters on the crown prince's visit and on the issues discussed during the talks, T S Tirumurti, Secretary (Economic Relations) in the MEA, said the two leaders also called upon countries to renounce use of terrorism as a state policy. Complicity of Pakistan in the Pulwama attack was underlined during the talks, he said, adding both Modi and Salman condemned the Pulwama attack. Earlier at a joint press event, Modi called the Pulwama attack a "cruel symbol" of the scourge of terrorism and sought punishment for the terrorists and their backers. The crown prince, however, did not mention the strike. On his part, the visiting dignitary said, "As far as terrorism and extremism are concerned -- which are common concerns -- I want to tell India that we will extend all cooperation to you -- be it intelligence sharing... not only with India but also with other countries."